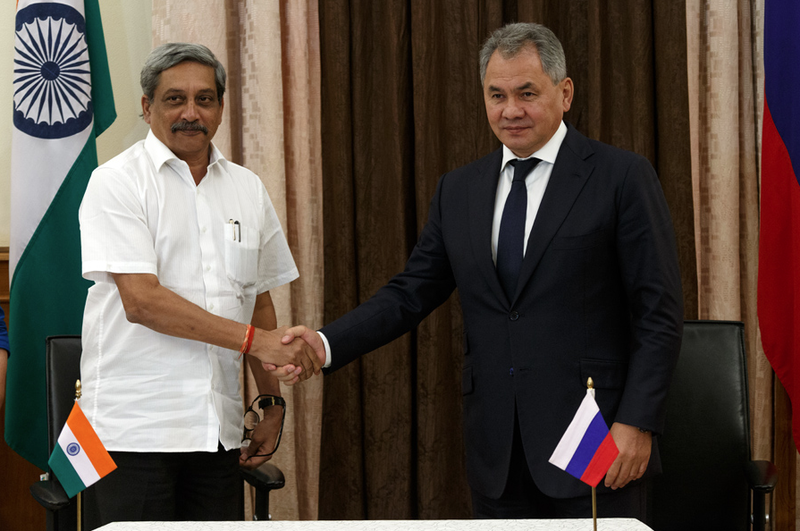 Defense Minister Sergei Shoigu, right, and Defense Minister of India Manohar Parrikar at a ceremony of signing a final protocol of the meeting of the Russian-Indian Inter-Governmental Commission on Cooperation in Military Industry, in Delhi. The Russian defence minister pointed out that the progress of joint production of Ka-226 helicopters, BrahMos and S-400 indicates technical cooperation with India should be expanded. The Russian and Indian defence ministries have been instructed to expand military and military-technical cooperation, Russian Defence Minister Sergey Shoigu said on Wednesday. "The extra tasks set in the course of the meeting Russian and Indian leaders held on October 15-16 indicate that we should expand the sphere of our military-technical cooperation," Shoigu said as the Russian-Indian inter-government commission for military-technical cooperation met in session for the 16th time. The parties have already begun a discussion of all issues that are related to the post-warranty maintenance and life cycle contracts for the military technologies to be provided or provided earlier, Shoigu said. "It goes without saying that we have noted with great satisfaction the progress achieved in our major projects, such as the joint production of Ka-226 helicopters, missile systems BrahMos and air defence systems S-400," he said. There is a special major program for naval ships, including submarines, Shoigu added. "I believe that today there is a good opportunity for reviewing the results of the previous year and identifying targets for next year. We are ready to discuss all crucial problems, issues and prospects for our military and military-technical cooperation," Shoigu concluded. The struggle against international terrorism requires consolidation of all forces and rules out double or triple standards, Russian Defence Minister Sergey Shoigu said on Wednesday. "What is absolutely unacceptable in the struggle against terrorism is the use of double and sometimes triple standards. Those who are terrorists on Monday cannot turn into moderate opposition on Tuesday. There will have to be fundamental consolidation of all sound forces in the struggle against this ill of the 21st century," Shoigu said at a meeting of the Russian-Indian inter-governmental commission for military-technical cooperation. He pointed out that the struggle against terrorism was a major issue.